I constantly tell my adult ESL/Pre-GED students to find connections between what they are currently learning to something they already know. Here’s my connection to becoming my own RA health advocate. When my first baby was born, I was determined I was going to nurse him. I thought I had read everything on nursing I could before he was born. However, what I didn’t read was how breastfeeding does not always come naturally for everyone. I was given a lactation consultant in the hospital without much luck and sent home with a bag of formula. At home, my little one and I still weren’t getting the latch-on figured out. I could tell he wanted to, but it just wasn’t happening which raised my stress levels to new highs. I was determined though and kept trying to move the formula out of my mind. Finally, after an early morning call to our pediatrician, I was connected with a La Leche League leader (a group for breastfeeding moms). She gently encouraged me that I could do it. She asked some questions and quickly figured out the problem. The memory of my son’s first real nursing session still makes me cry – 19 years later. Not only was I finally meeting his needs, but I had made a parenting decision that came true with some perseverance. Having another mom that I could call for help was amazing and I quickly began attending LLL meetings every week. It was amazing to hear seasoned moms share their stories and ask questions of me that helped me become stronger as a mom. They really listened. It didn’t take long until I was the one helping others which is an amazing feeling. When my second was born and I chose to tandem nurse, I found a subgroup of moms within the group that helped a seasoned mom with a new concern. (Wouldn’t it be cool if we had a similar group for RA?) I took a lot of life lessons from La Leche League, but a few really stood out when I was diagnosed with rheumatoid arthritis. First, I learned from LLL that my family and physicians are there to help me as a mom, but ultimately, I am the expert on my child. I know him/her in a way that nobody else will. I learned from other moms how to trust myself. If something didn’t feel right, it most likely wasn’t right for my child. This was true for RA too. When I returned two weeks after my initial appointment with my family physician, he was surprised to see me, but I knew something wasn’t right. A referral was made. Unfortunately, I didn’t always trust myself in the beginning and ended up staying with my first rheumatolgoist, who wasn’t a good fit, for several years. Instead of listening to what my heart was telling me, I used my rheumy as what my husband referred to as my “drug dealer” rather than a partner in my health. It just never occurred to me that I could change rheumatologists. Luckily, I had created a health team of a family physician I felt comfortable with and a naturopath that left me feeling like Super Woman after each appointment. They both reminded me that I know myself well and I needed to follow the journey that fit my individual needs. A new rheumatologist was found. At the second Joint Decisions Empowerment Summit this weekend, I felt a renewed strength in myself. I was reminded of how different each of the participants journeys have been, but how each one of us know ourselves well enough to speak out for what is right for who we are. Another lesson I learned from LLL was to share positive stories with my spouse about my child in front of him/her and just as importantly, to let our child overhear me saying good things about them when they weren’t the center of attention. 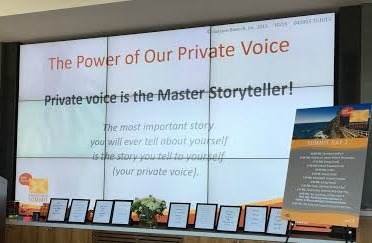 Rhonda, our Joint Decisions energy break coach, reminded us that we have a private voice always going on and what we tell that private voice is very important. Over the weekend, I was thinking about how sometimes I hear positives about myself from others, but I don’t always share those stories out loud for myself to overhear. A few weeks back, I told my class that the homework assignment I was giving was really important and if it wasn’t completed I would be angry. A student raised his hand and said, “Even if you are angry with us, you will still have a smile.” That was a huge complement to me. With at risk students, the greatest thing I bring to the classroom is my smile. Imagine if I shared that story out loud for my family and friends to hear? Would I feel like I am bragging to say good things about myself or would hearing it out loud encourage me to carry that smile with me more places knowing I am making a small but important difference in this world? Learning to be your own advocate in your relationships, job, and especially health takes time. It isn’t something that just comes naturally for many of us. This weekend I felt very fortunate to be part of the Joint Decisions team of advocates. We weren’t just a team of bloggers advocating for ourselves, but I really felt like the entire Janssen and Tonic team was there advocating for us, with us. There were so many times when a blogger would share something we wished was different and a Janssen member would say, “How can we help make this happen?” What a special question to ask. Good things are happening in the RA world and Joint Decisions is definitely going to lead the way in that. I’ll post more about the summit soon, but I am exhausted. We took in a lot of beautiful scenery and memories this weekend that I’d like to spend some time reflecting on. The Walking Strike is Over! Boy am I late reading this, but I wanted to send thanks for a great post. As we discussed at the Summit, none of us are in a vacuum. We bring all of our experiences with us when we become RA patients. Being able to connect all the positive things from LLL as a foundation to the great things you contribute as an RA advocate just underscores that fact. It was great to see you at the Summit and to be able to share the experience with you and the other great bloggers.